I love a good steak, and prefer to cook them at home so I know that it will be good. 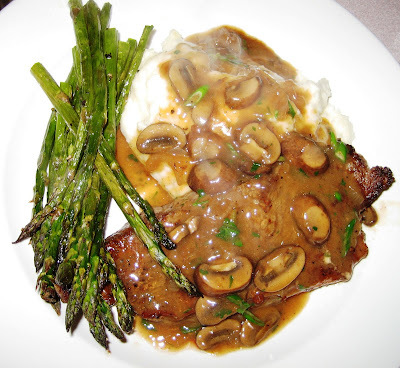 My friend Sue came over the other night and requested steaks with a gravy and I thought why not do a marsala and mushroom sauce, it would go perfect with steak! The result was perfection, I will defiantly make this dish again. I know there is a lot of butter in the sauce, but it really seasons it well and gives it a nice sheen. I served this with my mashed potatoes and oven roasted asparagus. Thanks for the great company and inspiration Sue! Heat the olive oil in a large sauté pan and add the shallots and mushrooms and cook over medium high heat until they become soft, remove and set aside. Wipe the sauté pan with a paper towel and add another couple tablespoons oil to the pan, and place over high heat until just starting to smoke. Season the steaks liberally with salt and pepper and then place into the sauté pan and cook for about 4 minutes per side until a crust has formed and steaks are medium rare. Remove the steaks from the pan and cover with foil to rest. Deglaze the pan with the marsala wine and then add the beef stock and reduce by 1/3. Add the mushrooms back to the pan and stir in the butter one tablespoon at a time until the sauce thickens and becomes a gravy-like consistency. Stir in the scallions and parsley and serve over the steaks. it was a fine meal for my family and me! it has a rich, tasteful taste that your tounge dies for.i had this once at a very expensive resterrant and it was not as fine tasting as this recipe! i recomende it to who ever likes a rich taste in thier steak. Absolutely delicious! Far better than I expected. I think this is a recipe comes from Argentina because they're specialists in all kind of steaks, actually once I was to Argentina and their recipes are perfect like this one.